A Rainy Day Essay. Welcome to our website. This is the one of the best and an unlimited the source of Essay and Paragraph. 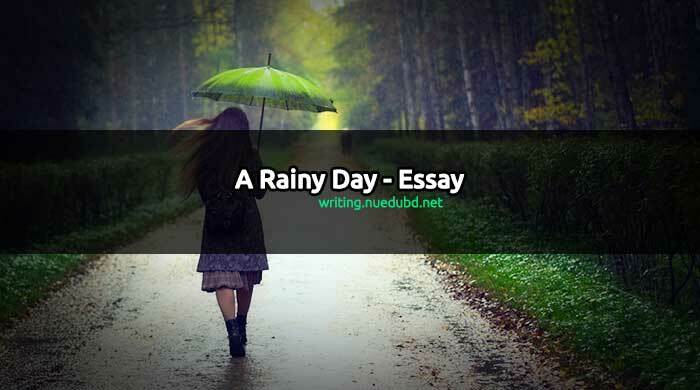 Now NU EDU BD writing section sharing the most useful A Rainy Day Short Essay for you. I hope you'll like it. Education is one of our basic rights. This is a very short and easy essay for you. Now check this out Short composition on A Rainy Day for you. Introduction: A rainy day is a day when it rains heavily. This day creates both pleasures and sufferings for us. The whole atmosphere is wet on that day. Some people enjoy to pass this day merrily but it is not enjoyable to all. Description: A rainy day is dull and gloomy. The sky remains cloudy. It rains in torrents. Sometimes it drizzles. The sun cannot be seen. Everything seems to be indistinct and hazy. Sometimes violent blasts of wind blow. Thunders are heard along with heavy rain. The whole atmosphere becomes eerie to us. To the poor: A rainy day brings great sufferings to the poor. They have to remain at home. They cannot go to their work. As a result, they cannot manage food. They have to starve. Even staying at huts becomes difficult for them. Water enters into their houses through the patches of their sheds. Sometimes, their humble cottages are washed away in torrents. They have to pass the day along with their inmates in dire sufferings. To the passers-by and the students: A rainy day comes as a dreary agent to the passers-by. The roads become muddy. They cannot walk down the road. Sometimes they slip on the road. Again those who have no umbrella suffer the most. They are seen drenched in rainwater. They have to wade through rainwater. The students also suffer on a rainy day. They are wet on the way to school. They have every risk of foot-slip and fall. The students who do not go to school fell happy at home. They can pass the day merrily amidst of other members of the family. They can enjoy television or play some indoor games. Thus the students can enjoy the holiday. To the rich people: A rainy day offers blessings to the rich people. They feel no tension. They feel relaxed. They heartily enjoy this day. They pass this day in complete rest and relaxation. They can forget the din and bustle of life. They can enjoy themselves different pastimes. They watch television or read newspapers. Sometimes they sit quietly by the window and listen to the Patter of the rainfall. They can pass this day under the soft blanket on the couch. They are surrounded by their friends and dear ones,. They also satisfy themselves with different homemade delicious foods. It seems the rainy day awakens all their pleasure and amusements. To the poet: A rainy day has special attractions to the poets and imaginative people. They are thrilled with this day. Their thinking powers arouse and poetic. Sensibilities are sharpened. They fell unimaginable feelings, emotions, and thrills in their interior hearts. The internal senses sing in praise of rain which comes as a great directive to them. Their sub-conscious state of mind is transformed and they feel infinite emotions. They want to plunge into the deep ocean of enjoyment. They leap with the rhythmic sound of the rain. They take pen and pencils and start writing poems or other articles either in praise of their beloved or nature. In nature: On a rainy day, naturally assumes a charming look. The whole environment becomes fresh and cool. Everything seems tranquil. The natural objects are bathed in rain. The leaves of plants and trees are tossed by the rain mixed wind. The birds are seen wetting on rain. The cattle go to the fields being drenched by rain. The whole atmosphere looks dreamy and also dreary to us. The normal life becomes paralyzed. It seems that nature itself is lamenting for the loss of some dear ones. Conclusion: A rainy day is a day of rain and darkness. People have to confine within their shelters. Everyone is affected on this day. In fact, a rainy day touches everyone’s heart more or less.